In a childhood spent reading (among many other things) superhero comic books, I never once encountered an artist who depicted the heroes the way I wanted them to look: the way I saw them in my head when I created my own stories for them. The images were all so… well, comical. Nobody took the characters seriously enough to satisfy me. It was a bit like the artists during the period of my greatest devotion to the art form—the late 1970s through the early 1980s—were a bit embarrassed to be drawing such childish subject matter. Everything had a touch of goofiness about it. The artists didn’t expect much sophistication from their audiences, so they simplified everything they created. I certainly wasn’t going to stop reading comics for their lack of sophistication… but it was never really enough for me. And then came Alex Ross. Alex did exactly what I was trying to do all along,very clumsily, in my imagination: he transformed the simply-drawn lines of my heroes into very human, very much larger-than-life people. He made them seem at once real AND iconic, almost like the characters in Edward Hopper’s paintings. I was transfixed, and I have been ever since. The image below is a terrific example of Alex Ross at his most powerful. The heroes in question—the members of the Justice League from my childhood—are true to the characters’ personalities, as represented in decades of graphic fiction. They’re larger than life, fleshed out, and above all (this may seem obvious) heroic. 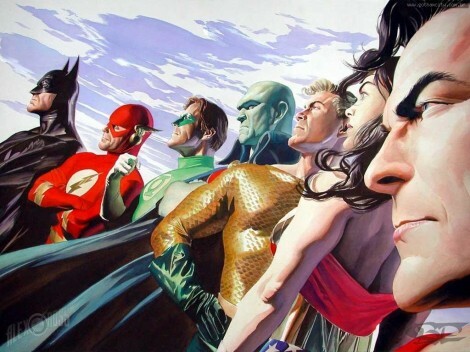 It’s almost as if Alex Ross is saying to me “Yes, Gwydion, you were right all along—these people are real, and they are amazing.” I was immensely relieved when I first discovered his work. Looking at these very familiar faces just plain makes me feel good. (Note to anyone looking to buy me a gift: you could do a lot worse than this hardcover collection of Alex Ross’ work, which includes the image above.) The seven of them seem like the living embodiment of ideas—self-reliance, speed, imagination and willpower, alienation, royalty, truth, and above all justice—but that’s not what compels me. I simply have a powerful and difficult-to-describe emotional connection to the image. I think that as a playwright, I sometimes forget about the ability of things visual to affect an audience. The traditional way of thinking about the difference between writing for the stage and writing for film suggests that while plays are composed of dialogue, movies are made of images. I used to believe this, but I no longer do. I think it’s an oversimplification that underestimates the importance of dialogue in film and—as I’m coming to understand more and more in my own writing—the value of visual elements on stage. I’m not just thinking about lighting and scenic design and costumes, mind you. I’m thinking about the entire visual concept of a play. More than just where characters move and how they stand in relationship to one another—what I think about is how the set helps make the idea of the play manifest. More often than not, with my recent work, I’ve found myself desperately wishing I could find some gifted artist to build me a miniature version of the set I have in my mind, complete with tiny people I can move around, so that I can, you know, play. I’ve even contemplated breaking out the Lego blocks from my childhood, which I’ve been saving for my son, to try my hand at making my own set… and I might just do that one day. I just want some kind of external, physical manifestation of what’s going on in my head (which is precisely what Alex Ross gave me with his work). Is that too much to ask? And I’m I the only playwright who thinks in those terms? Who else struggles to “see” a play? This is how I know a play really speaks to me: I ‘see’ it as I am reading it. I did see it. Actually, my brain was at war between what the film would look like and what the stage production will look like. Hah! Just came across this in Aristotle as I am reviewing for class: “In constructing the plot and working it out with the proper diction, the poet[playwright] should place the scene, as far as possible, before his eyes … the poet whould work out his play, to the best of his power, with appropriate gestures.” So you are in sync with Aristotle. I promise not to tell anyone. O, wait, I think I am posting it on your blog. Let’s get you one of these: http://www.dimensionprinting.com/ and CAD. 🙂 In all seriousness though, I think this is a very important element of creating live performance that you bring up. Visual is essential. The Visual design of a show is one of those unifying elements that transforms the space of the event, something a recorded performance in your living room or a movie screen can’t accomplish better than being in that unified space. Theatre, by changing and unifying a common space, transform it’s audience in a whole new world. I would LOVE one of those, though I’m sure I would only do evil with it. I do agree that the visual design of a show is important to the success of a story… though that does still allow for a great deal of leeway in how, precisely, to help a story succeed. I worry, naturally, about limiting designers’ palette by writing elaborate set and lighting descriptions into my work… but I still need to “see” the play I’m writing, at least for myself, and want to give them inspiring descriptions to work from, even if they riff.